There are hundreds of thousands of people across the world that will remember the huge impact Tomb Raider had on the world. Over 20 years ago, the very first Tomb Raider game console hit our screens with a bang, showcasing the talent of the young British archaeologist Lara Croft. We closely followed her adventures throughout a lost and far away world in search of lost treasures and hidden artefacts through abandoned temples and mysterious ruins. Of course, there were the more than occasional enemies to fight off along the way. We loved it, and so arose the Tomb-Raider franchise that still holds a strong position within the entertainment industry, from action-adventure console games, to comics and Hollywood movies, the story of Lara Croft evolved and found a fixed place within so many people’s hearts. The iconic heroine lives on till this day, and Microgaming, one of the most experienced and leading software developers in the industry, have created a slot game to fill this niche. In fact, this slot game although simple, is extremely satisfying. We look at the return to player, known for short as the RTP, and see how we can benefit from playing this brilliant adaptation of the popular adventure story. You may be asking what does RTP mean? Well, “return to player” is the term that casinos use to describe the percentage of all wagered money a slot machine will pay back to a player over time. Sounds confusing, but it is relatively easy to understand. Take this example; if you make one hundred bets at £1 on a slot that has a RTP of 90%, you could expect to receive approximately £90 in wins. The higher the percentage, the more that the player can win, over time. You may also come across the term “house advantage”. This is the term used to describe the remaining percent, in this case the 10% which is the percentage advantage towards the casino. 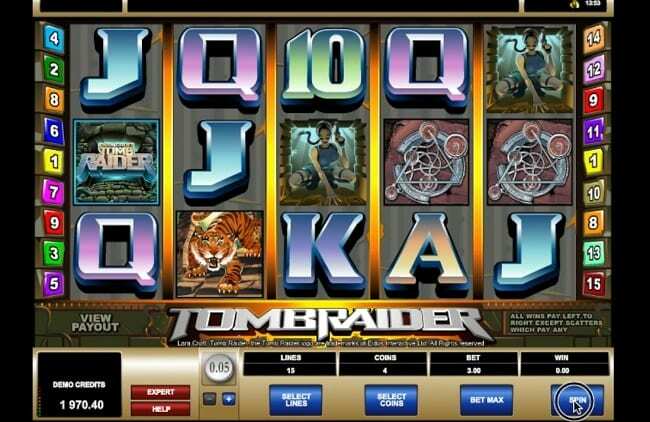 Now that is explained, we can take a closer look at the return to player Tomb Raider slots. This Microgaming slot has an RTP of 96.5%, which is very good and is just above the industry average of 96%. When looking at the Tomb Raider RTP, it helps to also take a good look at some other important stats and information. As you can see by the above information, the game may not pay out as large amounts as other online slots, but it certainly pays out often. The game has certain symbols that you should familiarise yourself with early on, as these are the symbols that will be bringing you the big wins that you will be looking for. The Wild Card for this game is the logo and landing this on a reel will bring you the opportunity to double your winnings. 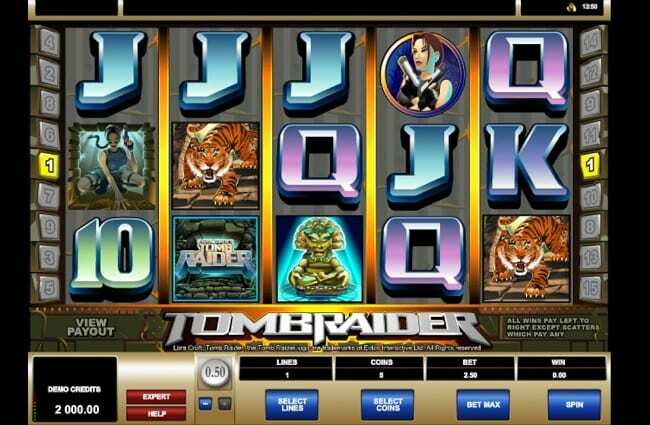 If Lara Croft herself appears on the reel then you have unlocked the Tomb-Raider Free Spins feature, a great feature that allows you to spin the reels for free which may even lead you onto more free spins. Keep your fingers crossed for at least 3 of the wild symbols to be in with the chance of winning the highest payout on the game, an exciting 7500 coins! This slot is a favourite for many online gamers, not only due to its fair RTP, but also to the cleverly designed bonus rounds. Enter the bonus round to discover a room packed with golden icons of which you can choose a certain number of, pocketing the cash that is hidden behind them. As we mentioned earlier in the article, the Tomb Raider payout is slightly lower than the industry average, however this should not put you off playing the game as there are so many other features which makes this one of Microgamings best ever games. There are plenty of reasons to play this game and if you are still not convinced, continue reading to find out more. Graphics and theme – remaining true to its original creation, the Microgaming slot adaptation retains its unique character and design that attracted many of us to it in the first place. With a background of ruined temples and various enemies and treasures employed within the reels, the slot transports you from the comfort of your own home to a far away adventurous world. Bonus features – mentioned in the previous section, the bonus features are what keeps hundreds of thousands of players returning to play this slot time after time. It is one of the first games created where you could win further free spins whilst using your free spins! Mobile app – As with many games nowadays, the ability to play whilst on the move is a huge benefit to people who have a busy lifestyle. 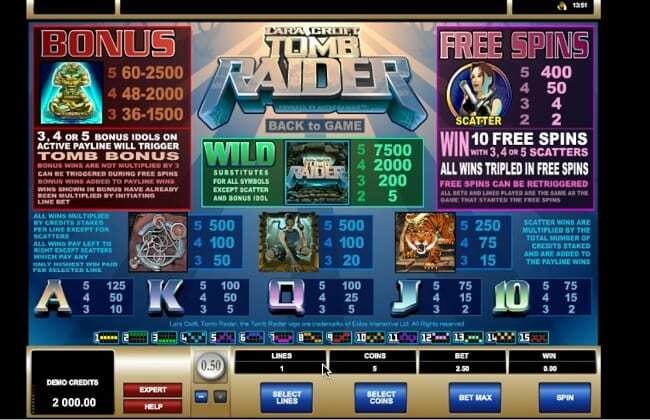 Many of the websites that offer this slot have their own apps that also feature the game. Using the app will have you playing the game in just a few quick clicks wherever you wish, whether at home or out and about, the entertainment is simply at your fingertips. Find out more about the games mobile versions here. For a slot that has 5 reels, 15 paylines and an RTP percentage of 96.5, Tomb Raider is a must try for existing or new fans. Players can adjust their coin size, the amount of paylines they play and the amount of coins they wish to wager per spin, so there is a lot of individual preference available. Along with the engaging theme, simple user interface and exciting bonus games, this Microgaming slot should not be missed. Tomb-Raider was cool back in the day, and it looks as though it is set to remain cool for many years to come thanks to the continued development of the hit franchise.